We all know that displaying art on your walls are something really common but did you know that there’s is another great way to do so as well? 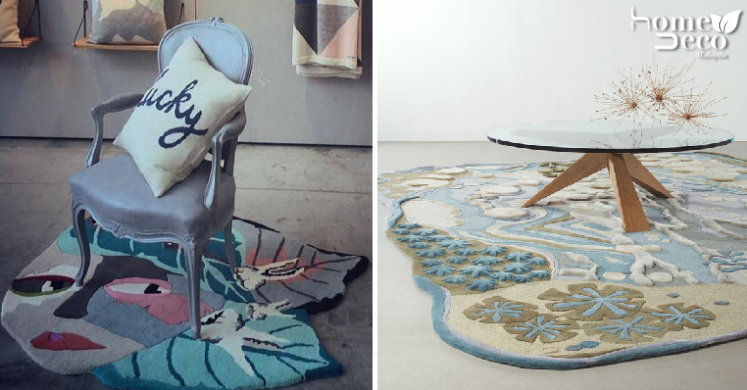 Here’s how you can wow guests by using some really artsy area rugs that will give that extra oomph to any space in your home. If you love the tooth fairy or just want to recapture your childhood then this cute sweet tooth rug is something that you need. Adorned with a whimsical fairy face, quirky hairdo and teeth decorations, everyone who sees it is bound to fall in love with the decor. Show your wild side with this exotic snow leopard rug that is made out of several hundred pom poms that looks both realistic and comfy. Don’t worry, no animals were harmed in the making of this rug but you can be sure that anyone who sees this will be charmed. Go for a more classic yet artsy style that is still pleasing to the eye with this topographical pattern on the rug. Made out of cool colours that will look good with almost any type of furniture, you can’t go wrong with this piece. Now, this is something really cool that you can easily customise for your home. It can be used as a few single pieces or fitted together to create a unique piece where the bears will really look like they are hugging each other. Let your imagination run free! Evoke the feel of nature with this cool rug that looks like a work of art that has some wavy edges to mimic the flow of the stream. It also has a 3D effect feel to make it pop even more. Dazzle your guests with this awesome rug that makes you want to constantly straighten it out but in actual fact, it’s only an optical illusion that is achieved by simply using three colours. Keep your guests entertained with this cute rug.